Summer has just arrived and the heat is starting to turn up, making it the perfect time for ice cream. Imagine yourself in 1904. You just met some friends for ice cream at a soda fountain. What would you have seen? Ice cream and drinks, of course. But what about the dishes, furniture, and even the tools to make some of those treats? For a glimpse into the past, take a look at this American Soda Fountain Co. trade catalog titled New Catalog of Cold Soda Requisites. The catalog begins by describing how artistic presentation is just as important as the taste of the food. American Soda Fountain Co., Boston, MA. New Catalog of Cold Soda Requisites, 1904, title page. Imagine ordering an ice cream sundae. What do you expect? The sundae, of course, but you might also get a side drink. 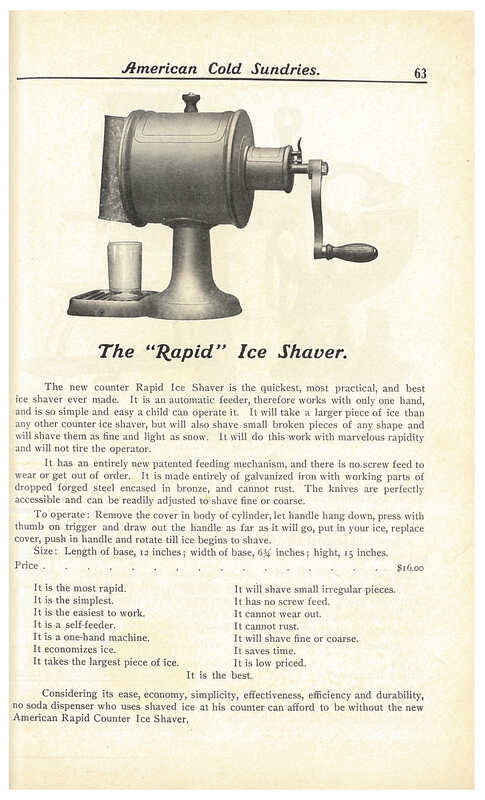 According to this 1904 catalog, “Many of the progressive dispensers are serving with their Sundaes a side drink of Ice Water, Ginger Ale, Cherry Phosphate or Claret Phosphate…” This catalog has just the thing for that. The Sundae Set for Side Drink is illustrated below. It includes a tray with a silver sundae cup, a Ginger Ale glass, and a round bowl spoon. American Soda Fountain Co., Boston, MA. 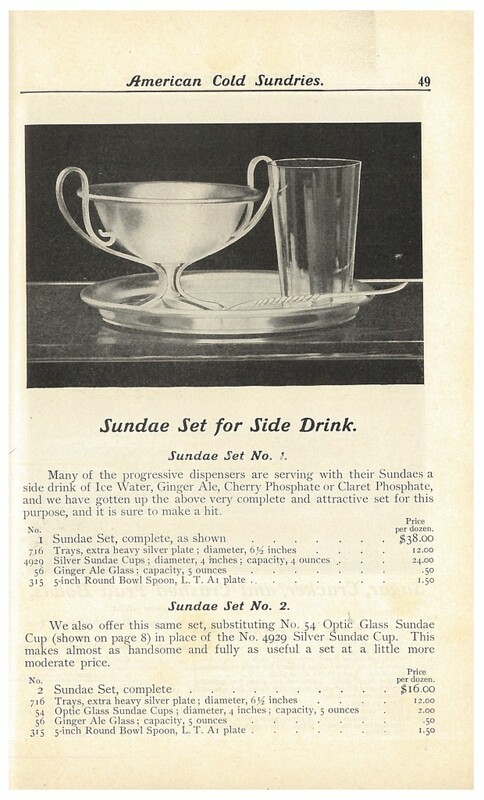 New Catalog of Cold Soda Requisites, 1904, page 49, Sundae Set for Side Drink. Tumblers and glasses are some of the most basic dishes found at a soda fountain. 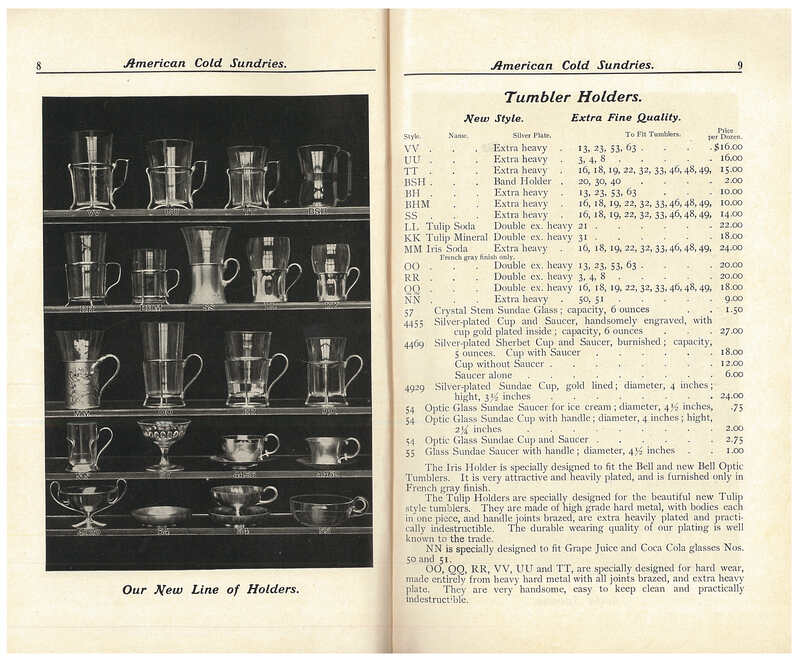 The page below shows a variety of tumbler holders, sundae cups, and saucers. American Soda Fountain Co., Boston, MA. New Catalog of Cold Soda Requisites, 1904, pages 8-9, tumbler holders, sundae cups, and saucers. A soda fountain also needs syrup bottles, like the ones below. These particular bottles are engraved with labels describing the flavors: Strawberry, Lemon, Coffee, Orange, and Vanilla. The bottles also have floral and scroll designs. American Soda Fountain Co., Boston, MA. 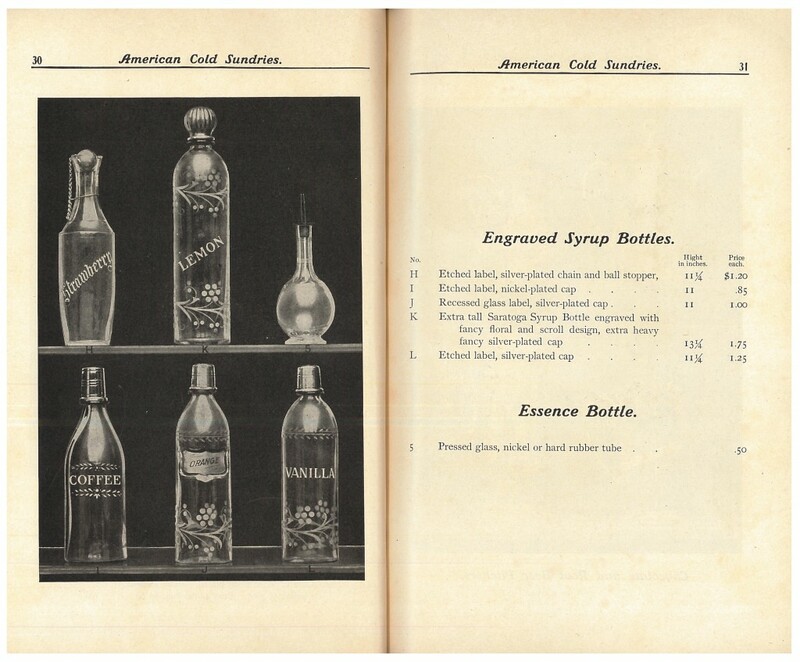 New Catalog of Cold Soda Requisites, 1904, pages 30-31, engraved syrup bottles and essence bottle. Ever wonder how an ice cream sandwich was made? With an Ice Cream Sandwich Mould, like the one illustrated below. 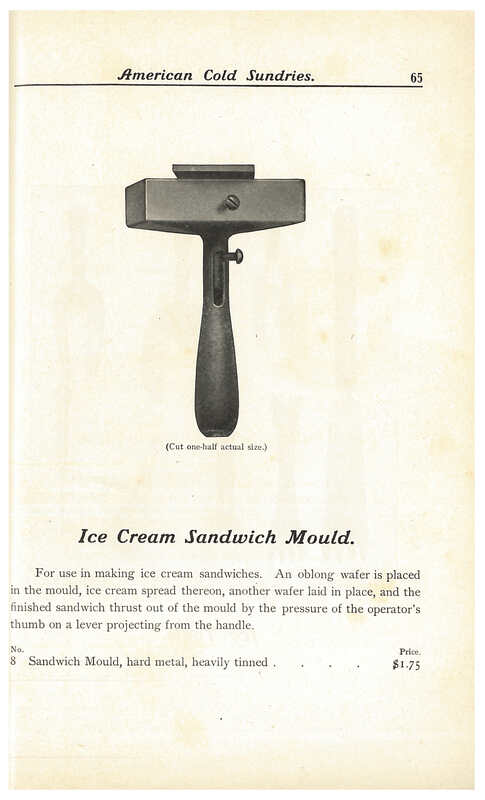 An oblong wafer was placed in the mould, then ice cream spread on it, then another wafer placed on it, and the ice cream sandwich was “thrust out of the mould by the pressure of the operator’s thumb on a lever projecting from the handle.” And an ice cream sandwich was made. American Soda Fountain Co., Boston, MA. New Catalog of Cold Soda Requisites, 1904, page 65, Ice Cream Sandwich Mould. American Soda Fountain Co., Boston, MA. New Catalog of Cold Soda Requisites, 1904, page 63, “Rapid” Ice Shaver. And, finally, you and your friends might have enjoyed ice cream sundaes while sitting at a steel wire table with matching chairs and stools, like the ones shown below. American Soda Fountain Co., Boston, MA. 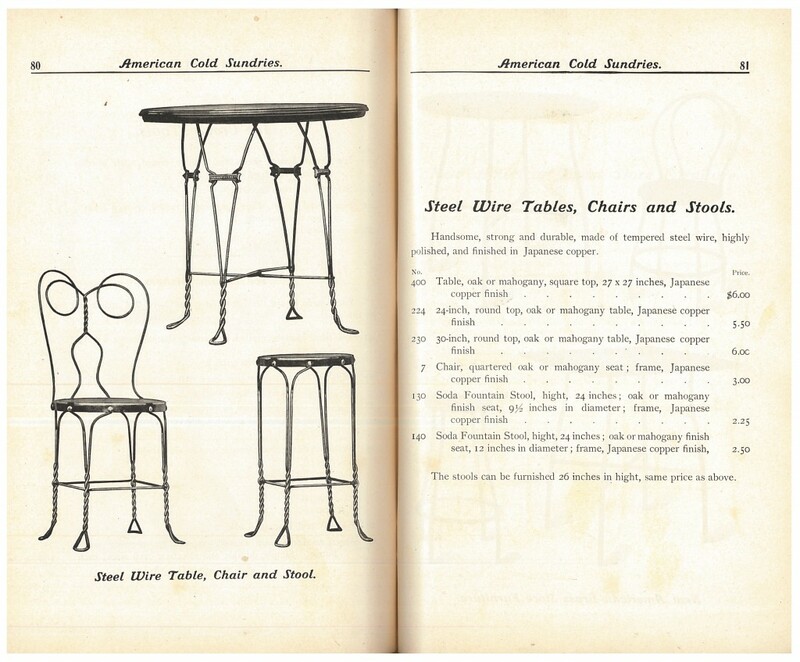 New Catalog of Cold Soda Requisites, 1904, pages 80-81, steel wire table, chair, and stool. 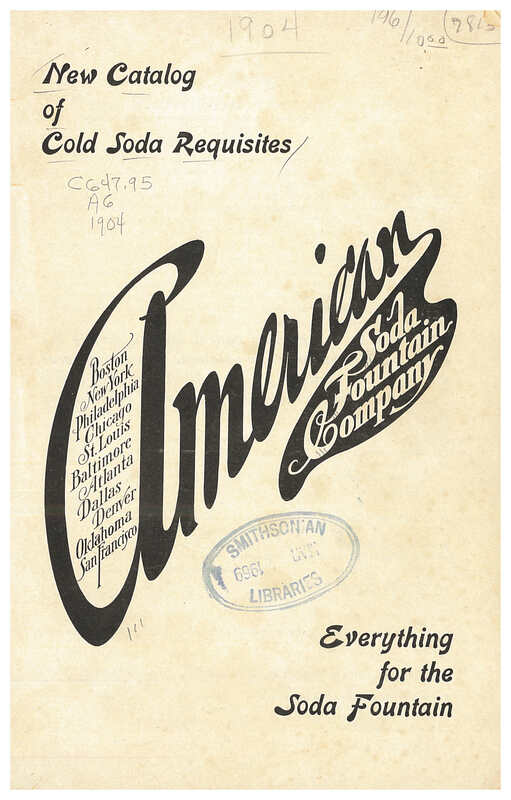 New Catalog of Cold Soda Requisites by American Soda Fountain Co. is located in the Trade Literature Collection at the National Museum of American History Library.